Little is known about the death relic, despite its infamy. Not its shape, its size, nor its purpose. Like the lives of the men who carried it, the object was lost long ago. Or was it? 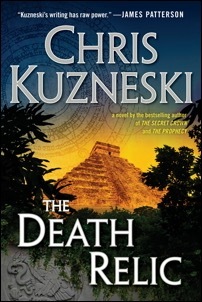 When Maria Pelati’s research team disappears in Mexico, she calls Payne and Jones, who offer to find the missing archaeologists. The duo quickly finds a link between the group’s work and its recent disappearance. Following clues left behind, the duo tries to find her team by solving one of the darkest mysteries of the New World. © 2019 Chris Kuzneski, Inc.